European Central Bank president Mario Draghi reiterated Thursday that the ECB stands ready to buy government bonds, saying political leaders must now decide whether they want to accept the terms. Speaking in Slovenia following a meeting of top ECB officials, Draghi said the central bank has put in place a "fully effective backstop" for governments struggling to fund themselves in the bond market. "At this point, it's really up to the governments to decide what they want to do," said Draghi. "The mechanism is in place." The ECB announced plans last month to make "outright monetary transactions" in the government bond market. Under that program, the ECB would buy potentially unlimited amounts of sovereign bonds on the condition that governments activate one of the two eurozone bailout funds. Spain is seen as the most likely candidate for the OMT program, although Prime Minister Mariano Rajoy has been reluctant to commit to a full program of mandated reforms and outside oversight. Rajoy said this week that a bailout request was not imminent. Draghi declined to comment on the situation in Spain or any other individual member of the 17-nation currency union. But he stressed that "significant progress" has been made in many vulnerable countries to reduce debt and overhaul outdated economies. Draghi stressed that the OMT program would be subject to strict "conditionality," although he argued that governments could benefit from the reforms a full bailout program would entail. 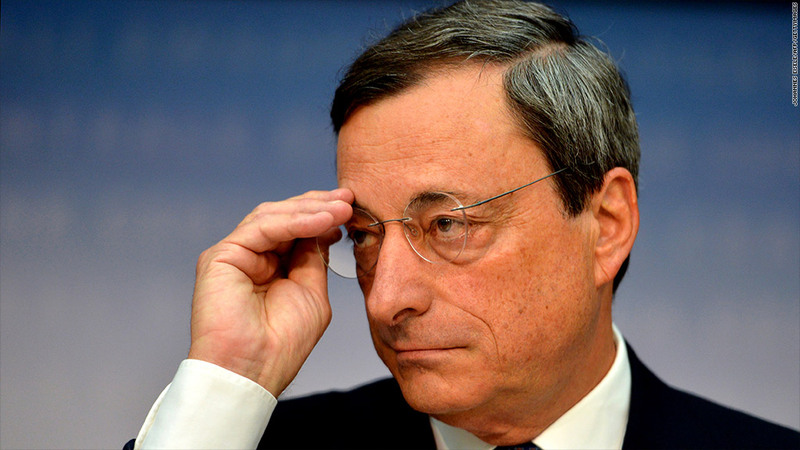 "There is a tendency to identify conditionality with harsh conditions," said Draghi. "But conditions don't necessarily need to be punitive." Meanwhile, the ECB's governing council voted to leave interest rates unchanged. The main refinancing rate has been at a record low of 0.75% since July. Draghi said the council did not discuss the possibility of a future interest rate cut. "So I would say it was unanimous," he added. The decision to hold rates steady comes as economic activity in the euro area continues to deteriorate. A key survey of purchasing managers in the eurozone fell in September, suggesting the region fell back into recession during the third quarter, according to data released Wednesday from Markit. Separately, the Bank of England also opted to hold interest rates steady and maintained the size of its asset purchase program at £375 billion .